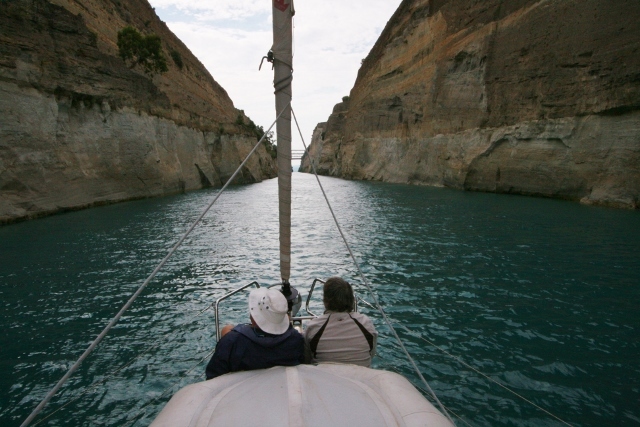 Planning your journey through the Corinth Canal can induce a fair amount of anxiety. 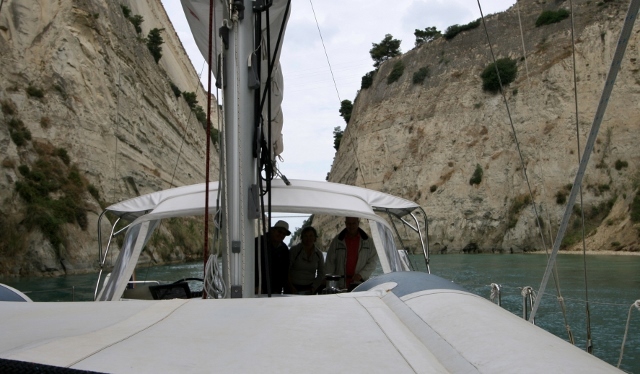 If you are assigned behind a large ship, the Canal controllers are very demanding that your yacht get as close as possible to the ship’s whirlpool wake. In fact, they often give the command “full power” and “close the gap” and many different types of hurry ups. There is quite a bit of current in the canal to deal with and shallows on both sides. We were keen to make Monday’s crossing early to ensure the lightest breezes,Tuesdays are usually closed for repairs in the canal. We all smiled in relief when we saw we were the first boat waiting. No ships in sight, so that meant we would be first in the canal. As we waited, another yacht approached under spinnaker in the distance. The Canal Controller was very happy that Mercier was there, “standing by”, sails stowed and ready to proceed. Yachts were in the canal coming from the east, so they proceed through and we enter the canal. Nautico*, the yacht behind us was not up to the Controller’s standards and several barks came over the radio to hurry up. As we passed, we could see the auto traffic waiting for the bridge to be raised so they could get across. 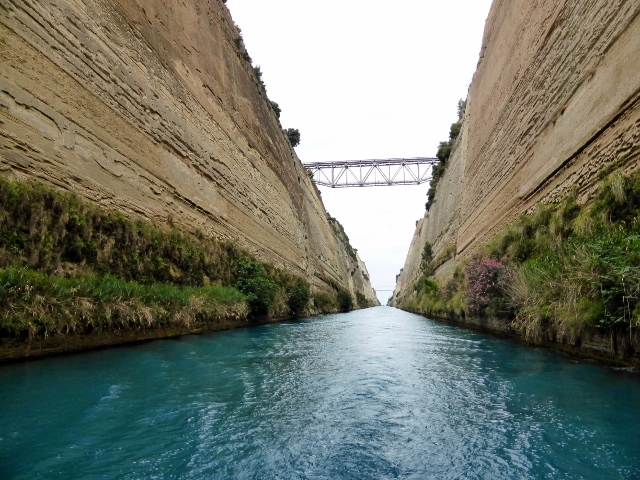 The canal’s first spade of dirt was dug by Nero, but even an excess of slave labour could not manage to dig the canal. It took gunpowder to manage that. Wikipedia has the story, so I won’t repeat it here. Interesting reading not only for the history but because of the curses that seem to befall anyone who wanted to build the canal.